The title of this post, is the same as that of this Press Release from Gatwick Airport. The plan is essentially very simple. The standby runway will be reconfigured so that it can be used for the take-off of smaller planes, whilst the current main runway is in full operation. In the near term, they intend to make the most of one of the world’s most efficient runways, but by the mid-2020s, the standby runway will be able to be used simultaneously. In the long term, Gatwick would aim to build the third runway on land that has been safeguarded for that purpose. This Google Map shows the airport. The current two runways stand out. The main runway is the longer Southern one. The standby runway is the shorter Northern one. 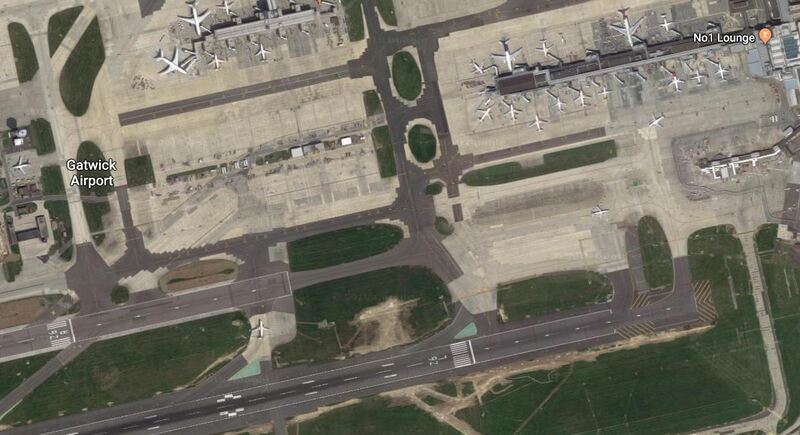 This second Google Map shows the Eastern ends of the two runways. It looks to me, that with rearrangement of the taxiways, aprons and the South Terminal, that the standby runway could become a runway meeting all the regulations. This is said in an article in The Guardian. 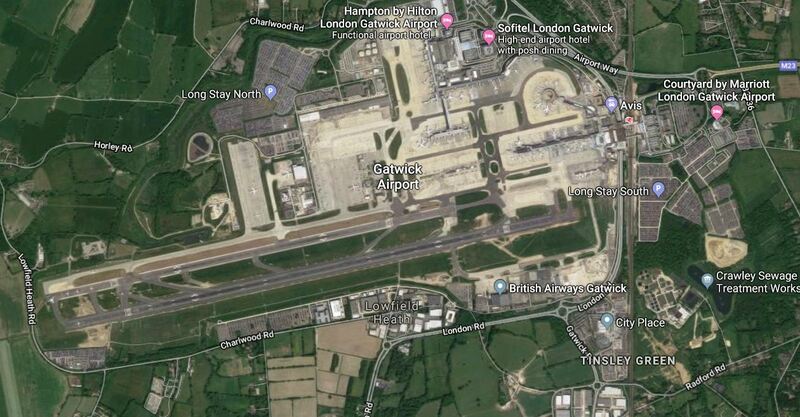 Gatwick’s emergency runway could be widened by 12 metres to comply with safety requirements for a 210-metre centreline gap from the main runway, and be used for an additional 10-15 short-haul flights an hour to take off. An expanded terminal, an additional aircraft pier of landing gates and work on roads around the airport could also be required to accommodate the extra passengers. The work would take two to three years to complete. If there is a need for for more runway capacity in the South East of England, I feel Gatwick’s plan is a good one. The Guardian article quotes the cost at half a billion pounds, which in the grand scheme of transport projects is not a large sum. London Bridge station cost £1billion. Canary Wharf station cost £500million. Liverpool Lime Street station remodelling cost £342million. The Northern Line Extension to Battersea is costed at under a £1billion. It is the sort of sum, that can be easily raised by a business like Gatwick Airport. It is the type of project, where during construction, with the application of good project management, there should be only minimal disruption to the following groups. Traffic on the nearby M23 motorway. The biggest disruption will probably come from transporting materials to the site. I also feel, that planned carefully and built over the two or three years quoted in the Guardian, that capacity could be upgraded in a gradual manner, which would be easier to utilise, than say the massive increase that would be afforded by a totally new runway. In The Rise Of Gatwick Airport, I wrote this about the rail connections to Gatwick Airport. I found this article in TravelWeekly, which is entitled Gatwick outlines plans for a train departure to London every three minutes. It gives a very good summary of the train services that will run to Gatwick after Thameslink is completed. • Two trains to London Bridge – originating from Littlehampton/West Coastway, and Haywards Heath/Three Bridges. That is a total of twenty trains to and from London and beyond and most of the South Coast from Southampton to Hastings. How many better rail-connected airports are there anywhere in the world? The article also quotes Guy Stephenson, the Airport’s Chief Commercial Officer as saying. The new high frequency service that will serve Gatwick will transform rail journeys for our passengers, with capacity doubling and a train to London every three minutes. Crucially, the new trains will be much more reliable and will be stacked with amenities suited to the needs of air travellers. Combined with robust new track and signalling systems, Gatwick’s passengers will experience a really pleasant and dependable service. Reading the article, you might think that Thameslink should be called Gatwicklink! According to this Press Release on the Gatwick Airport web site, Gatwick Airport are going to spend £120.5million on updating the rail station. This is an architect’s impression of the new station. I also think that Gatwick could extend their Gatwick Express services. I think we can also see development of Airport services to and from Gatwick Airport station based on the following existing services. Reading via the North Downs Line. Tonbridge and Ashford International via the Redhill to Tonbridge Line. Will we be seeing a second Gatwick Express route from Ashford or Ebbsfleet to Reading via Gatwick Airport? It would inevitably get known as the M25-on-rails. It gives a large number of passengers a way to get to Gatwick and Continental Rail Services without going through Central London. It could serve Heathrow, if they got their act together. Surprisingly, I think this route will be quicker to go between Reading and Gatwick, than using Crossrail and Thameslink with a change at Farringdon. The trains for such a service could be the same as the new Class 387/2 Gatwick Expresses, but with an IPEMU capability. But it wouldn’t be just an Airport service, as I suspect that given adequate parking at stations, it would become a valuable cross-country route linking the rail hubs of Ebbsfleet, Gatwick and Reading. After all, North of London, the East West Rail Link is being created from Reading to Cambridge via Oxford, Milton Keynes and Bedford. Southern also run a service from Milton Keynes to South Croydon via the West London Line. In the future this service will serve Old Oak Common station on Crossrail, HS2, the West Coast Main Line and the North London Line. So will this service be extended from South Croydon to Gatwick and become a third Gatwick Express service? These two additional Gatwick Express services would greatly increase or ease the airport’s links across the wider South East and to HS2 services out of Euston. The only problem, is the overcrowding on the Brighton Main Line. That post was written in February 2016. Since I wrote the article two years ago, the following has happened. Thameslink has opened and is now running eight trains per hour (tph) between Gatwick Airport and London St. Pancras International. In Gibb Report – Gatwick Airport Station Should Be Transferred To Gatwick Airport, I reported on what Chris Gibb said about the ownership of Gatwick Airport station. Luton Airport has been pressing for a better service. It currently has ten tph to London with timings of between 34-42 minutes. There are four tph between Gatwick and Luton Airports, two of which take 80 minutes and two take 100 mins. The world and his wife are complaining about the cut-price Class 700 trains. The Class 700 trains may be OK for short journeys, but they are a nightmare between say Brighton and Cambridge. Travellers on the East London Line are complaining that getting to Gatwick is not easy as only two tph stop at Norwood Junction. If the Bakerloo Line is extended to Lewisham, then it will call at New Cross Gate. The Thameslink service needs to be improved. The trains need a major upgrade. Should there be a limited stop service, running at four tph between Brighton and Bedford, which stopped at Gatwick and Luton Airport and the Central London stations? Should at least four tph stop at New Cross Gate and Norwood Junction to connect to the East London Line and the proposed Bakerloo Line extension to Lewisham? Could a 125 mph bi-mode be developed, that would enable a service between Gatwick and Sheffield? As there could be up to six spare paths to be allocated on Thameslink, there are a lot of possibilities for new and improved services. If other services were extended to Gatwick Airport, it could become a major rail hub for the South East of England. London and the South East needs more runway capacity. Extending the standby runway at Gatwick, effectively creates a very useful half-capacity runway. Developing a major rail hub at the Airport, would be useful for all sorts of reasons. Adding a second full-size runway would make Gatwick one of the busiest airports in the world. Gatwick may be the wrong side of London, but I think it offers better possibilities than a third runway at Heathrow.